Ingrid Hamberg and I, better known collectively as 'Anna and Ingrid' perform throughout the Puget Sound area. We both sing and play flat fiddle and hardingfele. In addition, Ingrid plays cello and I play nyckelharpa and säckpipa. We perform for parties, receptions, and dances. We've also enjoyed radio play in the US and in Scandinavia. So contact us if you need music - adorned in traditional costume and wielding an army of instruments, we magically fit in with any occasion. 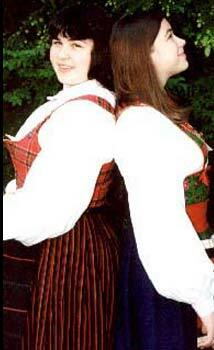 Pictured to the right are Ingrid and Anna, respectively.